The newly introduced LWB version gets a few minor cosmetic updates, especially on its frontage. However, the side and the rear profile of this luxury SUV remains to be the same as its existing variants. On its front facade, the company has re-structured the design of the headlight cluster with an improved lighting pattern. The front radiator grille too gets a minor tweak with a more pronounced design. The rest of the frontage remains to be the same as the existing variants. The front bumper comes with a body colored paint that has an in-built air intake console, which adds to the classy appeal of the frontage. The bonnet is smooth and it comes with “Range Rover” lettering that enhances its masculine looks. The side profile of this SUV remains to be the same with a plain and decent design. The window sills, external mirror caps and the pillars have been garnished with glossy black finish, while the roof and the door handles comes with body colored paint. The wheel arches of this variant have been fitted with a set of 20-inch 5-split spoke style alloy wheels that adds to the elegance of the sides. Its rear profile too remains to be the same with a sweptback design taillight cluster, a large windscreen and an expressive boot lid. The interiors of this long wheelbase version are unbelievably spacious and luxurious. The company has increased the wheelbase by about 140mm, which has given the car maker a lot of scope to improve the rear cabin leg space. As soon as you step inside the vehicle, it gives you a luxurious feel like no other vehicle. The company has used top-notch materials inside the cabin, which has resulted in giving a luxuriant finish inside. The cockpit section of this SUV comes fitted with a lot of user-friendly equipments and features that makes the journey fascinating. It comes with 18-way adjustable driver and front passenger seats covered with semi-aniline leather upholstery. In addition to this, the company also incorporated a heated leather steering wheel with quite a few control buttons mounted on it. For the convenience of the occupants, the car maker has installed several exciting utility features such as auto dimming interior mirror, customer configurable interior mood lighting , front central console cooler compartment and other such features. Under the hood, this 2014 version of Land Rover Range Rover LWB 4.4 SDV8 Vogue SE trim comes fitted with a powerful 4.4-litre, V8 diesel engine that has 4367cc displacement capacity . The company incorporated this particular engine with a turbo charging unit that allows it to produce a peak power output of about 334.4Bhp at 3500rpm, while yielding a mammoth 400Nm of torque between 1750 to 3000rpm. The company has coupled this engine with an advanced 8-speed automatic transmission gearbox that helps in improving the fuel efficiency and performance of the motor. The handling of this variant is excellent, thanks to the advanced power steering system, which is tilt and telescopically adjustable. It offers a precise response irrespective of the speed levels. The company has equipped the front and rear wheels of this SUV with a sturdy set of disc brakes accompanied by high performance brake calipers. These brakes receive the assistance from the ABS with EBD and several other traction control programs as well. The Land Rover Range Rover LWB 4.4 SDV8 Vogue is one of the mid level trims available in its series. This latest version is blessed with several top rated comfort features like no other vehicle in its class. It comes with an advanced 8-inch touch screen system comprising of Meridian sound system, Television tuner and has an option for incorporating a navigation system as well. It comes with a list of features, which also includes a four zone automatic AC unit with climate control and well places vents, a multi-functional steering wheel with heating system, a front center armrest with cooler compartment, auto dimming interior lights, reverse parking assistance for simpler parking, cruise control system with active speed limiter and many other such advanced functions. It also comes with a sliding panoramic roof, rain sensing windscreen wipers, rear executive class seating, which are just to name a few among the long list. The safety features of this newly introduced trim are unparalleled, which ensures a top level protection to the passengers and to the vehicle as well. The company built this SUV on a strong body structure that gives it an ability to to absorb the impact caused in case of collision. To further ensure the safety, this vehicle come with airbags for the driver and passengers, central locking system, ABS+EBD, brake assist , seat belts for all the occupants, key less entry, volumetric and perimetric alarm along with many other aspects. Pros: Improved cabin space, sophisticated features. Cons: Price tag, fuel efficiency. 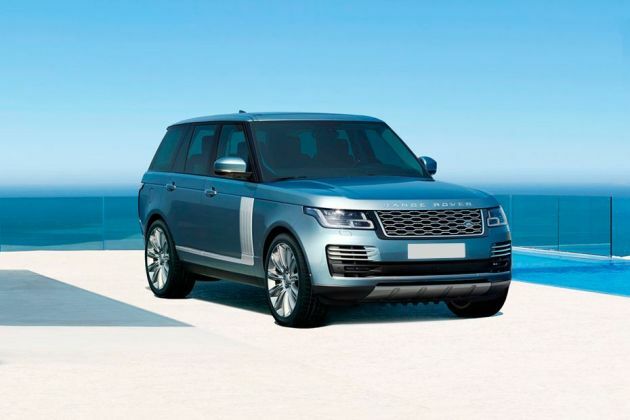 JLR, the highly acclaimed automobile company in the world has rolled out the long wheel base version of its high end luxury SUV Land Rover Range Rover. The company is offering this particular version with both petrol and diesel engine options out of which, the Land Rover Range Rover LWB 4.4 SDV8 Vogue SE comes as the mid level trim. This variant is equipped with an advanced 4.4-litre diesel power plant with a whopping displacement capacity of 4367cc. The manufacturer claims that this engine takes only about 6.9 seconds to reach a 100 Kmph speed mark and it can go up to a maximum speed of about 218 Kmph, which is quite incredible. This LWB version comes with a wheelbase of about 3120mm, which is about 140mm longer than the existing variants. This has helped the company to increase the rear cabin leg space by around 186mm, which will add to the convenience of the passengers. The company has retained all the features that are standard in the prevalent Vogue SE trim. In addition to this, the manufacturer has made minor tweaks to its front facade by retreating the headlight cluster that dazzles the frontage. On the whole, the introduction of this version is being expected to spur the sales of the company in the high end luxury vehicle segment in India.